This is an excellent read. I always read Picoult's books. No matter the topic, she weaves a great plot with an interesting perspective on human nature. Racism rears its ugly head in the corners of society. Those of us who are unaware, must educate ourselves. There is no excuse. The book made me most uncomfortable, but, as Picoult writes in the afterword, those whose lives white privilege should be uncomfortable. Without books like this, we'd never understand. It is for this reason that I follow quite a few people from different walks of life on Twitter. As ever, the plot is well executed, the topic dealt with very well. She has done her research. 'Nuff said. Thanks for this review so informative. I have read a few of Picoult's books. This one sounds intriguing. I will look for it at my library. Good review! I've never read any of her work. 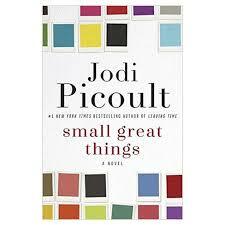 Jodi Picoult, one of my favourite authors. Imust see if it is in our library. The raccoons are they coming inside for the warmth? They are so pretty, no wonder Annabelle growled. Guess you have your winter clothes all ready, as I hear there has been snow in Alberta already. I haven't read all of Jodi Picoult's books. But I do have this one on my kindle. Thanks for the reminder. And thank you for reviewing!